A 10-year-old girl in Orlando, Florida managed to free herself from the clutches of an alligator's jaws by using a trick she learned at a gator-themed adventure park in the Sunshine State. The young girl was sitting in shallow water, about 2ft deep (60cm), in a lake in Orange County’s Moss Park on Saturday, when she was attacked by the gator roughly twice her size. Once the gator had a hold of her, the girl gouged it in the nostrils and was then able to prize it’s jaws open and free herself. She was bitten on her knee and calf by the 8ft 9in reptile, according to officials. “She had puncture wounds but I don’t think they’re life threatening,” the Orlando Sentinel reports Florida Fish and Wildlife Conservation Commission (FWC) spokesman, Chad Weber, as saying. “It’s one of the things us Floridians just know, if there’s a body of water, there’s likely to be a gator in it,” Weber added. 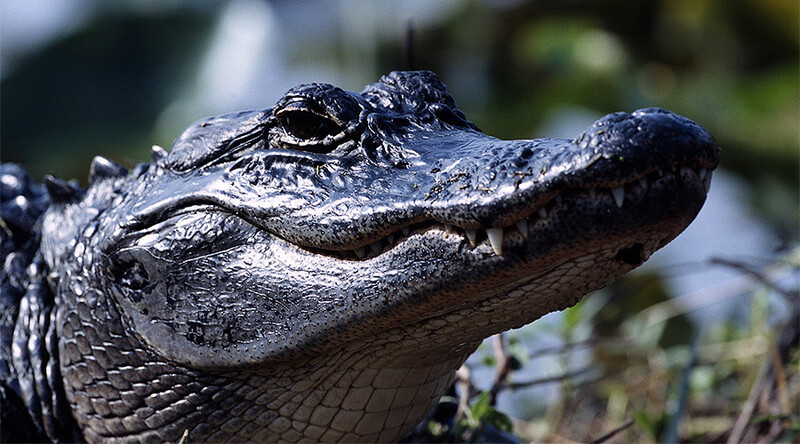 "To get an animal with the strongest bite on the planet to let go of you is a miracle," Gatorland spokesman Donald Aldarelli told WFTV. "I'm just happy that she heard it here." The animal was then captured and killed by an FWC trapper to prevent the beast from attacking anyone else in the park. The parks waterfront will also be off limits for the next week while the FWC conduct a full review. According to FWC statistics, there have been 388 documented gator attacks in Florida since 1948, 24 of which have been fatal.